Today, the world is entering an era of convenience and portability. As such, businesses anywhere from small and medium enterprises (SMEs) to corporations are increasingly bringing their services and products on to the smartphone screen in order to better interact with customers or risk falling behind. This paved the way for the rise of IT outsourcing companies like Savvycom, who often possess the technical capabilities to help other enterprises turn ideas into reality through mobile app development company. However, this process is not one without obstacles. Most of the time companies struggle with finding the right partner to develop their ideas into mobile apps, or simply finding a partner who understands their vision, purpose and requirements. To ensure success when outsourcing an app idea, Savvycom would like to present 4 steps below. What is the overall goal that the app aims to achieve? What can the app do in terms of functions and features? What are the platforms that the app is expected to be based on? Companies should also consider the effect that competitors might have on the success of the app and the revenue it brings by doing extensive research on the target market of the app, identifying potential threats from competitors, engaging with experts to decide the feasibility of the app, make the idea open for feedbacks from the right individuals, etc. One of the first things companies should do in order to look for the right partner is requesting the app portfolio from potential partners. This will give companies a good insight into their partner’s track record, experience, product outcomes and reliability. In addition, making sure that the developed apps are publicly shown in stores, checking for ratings and customer feedbacks are also critically important. Also, when looking for a partner to outsource an app idea, it is also vital to check for details about the partner such as reputation for outsourcing apps, responsiveness, meeting deadlines, and whether or not the partner has been certified or credentialed with awards and recognitions of any sort. The partner must also be able to understand the vision, mission, purpose and requirements of the apps, so meeting with their representatives and the team responsible to outsource the app idea is also crucial to produce a successful outcome of the app. Companies should conduct interviews – both online and offline – with their partners to determine the depth and effectiveness of their commitment. As sometimes it is difficult to find the right partner, Savvycom, being Vietnam’s Most Trusted App-Developer and Tech Co-founder, ensures that clients receive the best outcomes and app solutions for their ideas. With this in mind, Savvycom in the business of outsourcing app ideas is helping clients turn ideas into reality, through building world-beating apps and digital innovation. In any case, a partnership in outsourcing an app idea requires a project to be planned and executed. This of course requires a meeting between two parties to have a consensus on how the project is to be done, and in the process, set up key development stages. These stages are projected target outcomes for the entire development cycle of the app. Keeping in touch constantly with the developers is also crucially important. During the entire project development cycle, developers may create mistakes that should have been able to avoid by proper communication. The most important person to be the focal point of contact should normally be the project manager, who is often a software engineer. Therefore, companies need to monitor the development cycle closely, and consider rewarding the developers once they advance to the next development stage effectively. Setting up development stages for the project also means that both parties can discuss in further details which part of the project is feasible, which part is not and needs to change, among other issues when planning out the progress in outsourcing an app idea. This step is primarily to assess the issues surrounding the developed app if there is any. Before carrying out this step, however, companies can choose to test and evaluate the apps that are already published by their partners first to check for defects and capabilities, which in turn helps to decide their partners’ expertise and performance. Testing the app to evaluate and provide feedbacks for further changes after outsourcing the app idea is to prevent any chance that the app is faulty upon reaching customers, which is never a good thing since this will significantly reduce customer outreach due to bad ratings. Of course, updates and patches can be delivered later on, but nothing beats the first impression. If it goes bad for the first time, it goes bad for a long time. To conclude, the above 4 steps are recommended when outsourcing an app idea to have a fruitful outcome and counter challenges in the process. 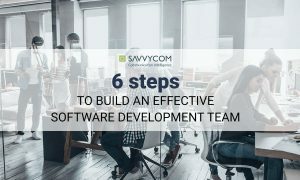 With experience in outsourcing and building quality apps, Savvycom believes that companies and other outsourcing firms shall reach a successful partnership if they take these steps into consideration when collaborating.